The festival of Akshaya Trithya symbolically welcomes abundance into life. This abundance is family focused, and creates richness of relationship, food, and wealth. Bhavanti krta punyaanam srisukta jaapinam. That is to say that he who meditates on the SriSuktam is freed from greed, jealousy and other sins. What occurs to me is– he who meditates on SriSuktam, would mean he who studies and assimilates it. This leads to a state of acceptance, which in turn would keep greed (a reaction to the insecurity of scarce) and jealousy (a reaction to the insecurity of want) .Practising the SriSuktam is also a part of being proactive, and when one becomes proactive then the progression is balance. Abundance and prosperity is personified as Goddess Lakshmi. 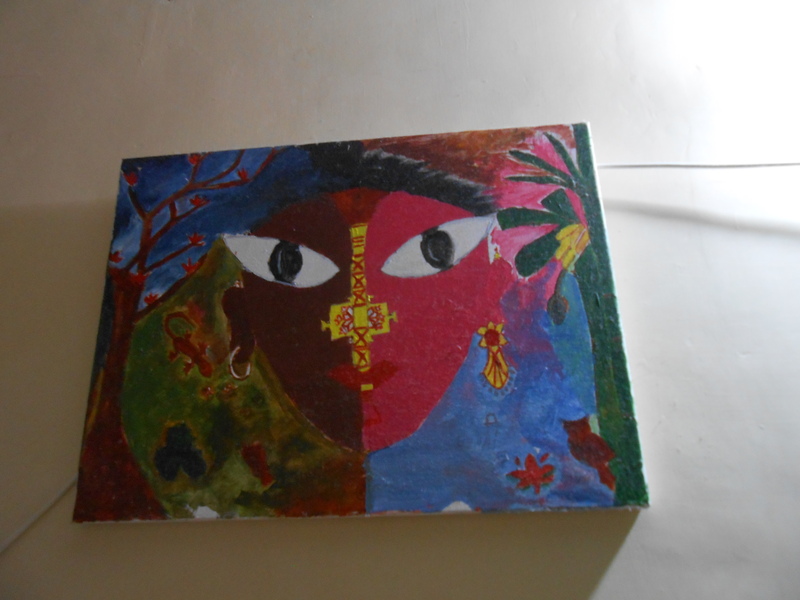 In icon worship the goddess gets symbolized as the Kalash 1. This Calash is ritually worshiped. Goddess Lakshmi is believed to reside on that point on our forehead when the central parting of hair begins. The Bhagwatam says “Putram, Pushpam,phalam, thoyam yomeya bhaktyaprayccati” if a person can perceive the grace of Goddess Lakshmi in everything and everybody the person automatically overcomes arrogance and attachment. The worship of Goddess Lakshmi does not call of elaborate rituals, or purification rituals. All it requires is recognizing and surrendering to the omnipresence and omnipotence of the Divine. Various texts prescribe various ways of creating a Kalash. The Late Swamiji of Admar Mutt of the Udupi Octate always insisted on mansapuja, that is what is guided by your instinct and intuition. 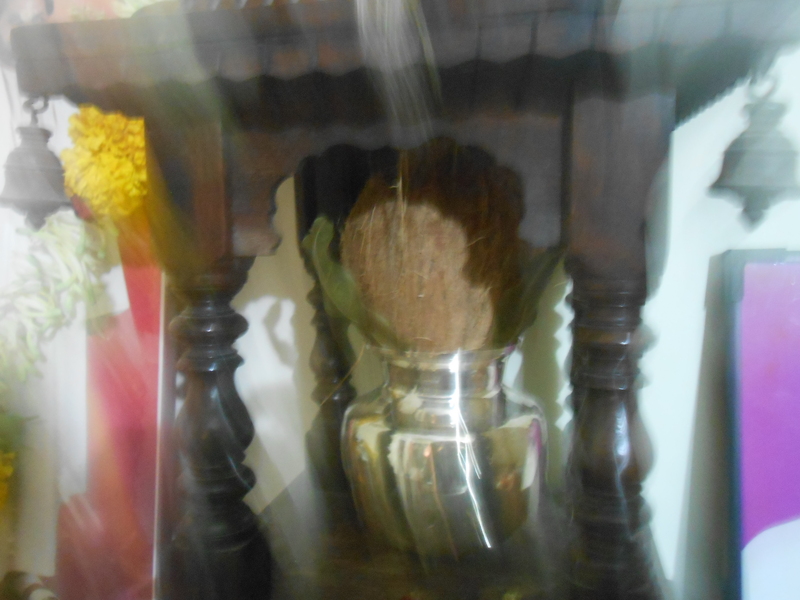 This was seconded by my husband’s Guru Sri Paramahamsa Gyaneshwarji of the Kurukshetra Audhoot Ashram so I create the Kalash with a kumbha or pot, pour water till it is half full. A coin/ring a circle of mango leaves, and a coconut on top. Creating altar—this is again personal. I have my altar such that I pray facing the East. I find that “studying and assimilating”is a continuous process. After more than 3 decades of listening to and reciting Vishnu Sahasranamam and Lalitha Sahasranamam, I stumble upon unexpected insights all the time. And sometimes, they literally stop me in my tracks. I can understand what you mean, I think it is called epiphany.